David Banegas is opening a private studio in Highlands. He is a Bolivian born artist, specializing in action painting. David is best known for his colorful portraits of Hollywood’s historic and contemporary A-listers such as Marilyn Monroe, Heath Ledger, and Johnny Depp. 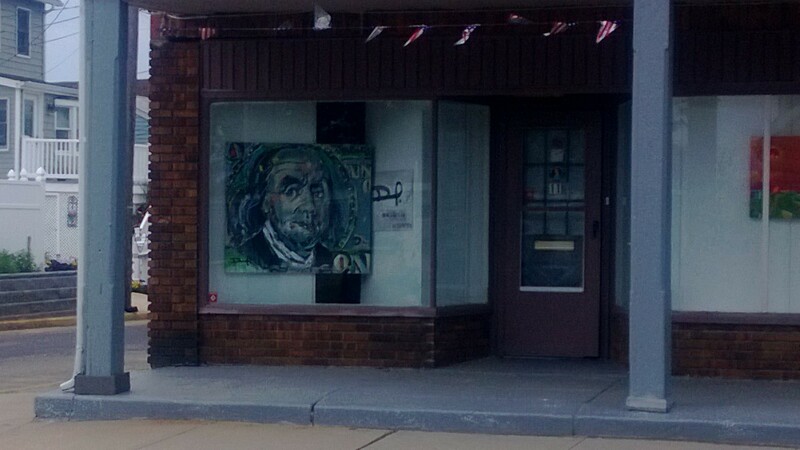 His main studio is located on 43 Broad Street in Red Bank, NJ. *By appointment only. He also has a private studio on 11-13 Miller street Highlands. So when walking to or from Inlet or Wind & Sea, take a look at his work. Yes, but has he ever done Elvis in velvet? That’s the former Gertie’s candy store ! You mean Gertie’s Spice Shop? That’s on Bay – this is on Miller. Nope. Gertie’s was a candy store at the end of Miller, right next to the beach,. We went there every day in the 60’s. Oh…”Back in the ’60’s”….so you mean like in the last century? I don’t know if they were good, but if you remember them…..
Well let’s just say you’re probably lucky if you can still remember anything! I always wondered what that space was originally. Thanks! I think really cool I love his work. I hope this is the first of many artists that are attracted to Highlands. It is a perfect location for an artists’ colony.